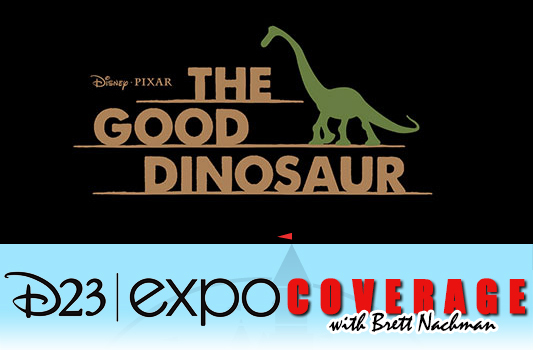 “This is the biggest ‘what if?’ ever,” John Lasseter said today at the Animation panel at this year’s D23 Expo in Anaheim, CA, in describing Disney/Pixar’s animated feature The Good Dinosaur. 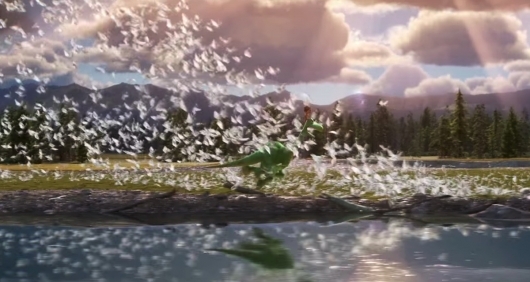 Most Pixar films start off with big questions, he said, and The Good Dinosaur is no exception. Footage was shown, and details about the characters and who’d be voicing them were announced. 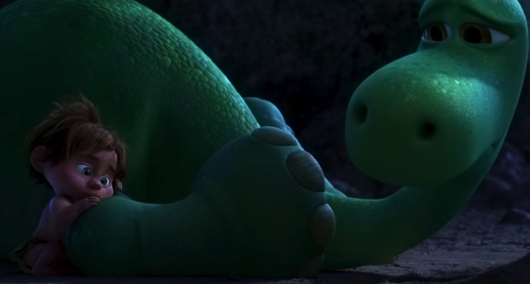 The main character is Arlo the Apatosaurus, as voiced by Lucas Neff. Other characters in the film include members of Arlo’s family: John Lithgow as Poppa, Frances McDormand as Momma, Bill Hader as older brother Forrest, Neil Patrick Harris as brother Cliff, Judy Greer as sister Ivy, and then there’s Neff as Arlo. Hader, Greer and Neff came out onto the stage, having just met one another. I understand why most people are reluctant to embrace the films of Wes Anderson. They are clearly not for all tastes. Anderson makes movies about lost souls searching for emotional support and redemption in meticulously-created worlds where everything is filtered through a child’s pure sense of wonder. He is one of the most unique voices in American cinema today and though his films are set in places not fully grounded in the reality that we are all accustomed to, his characters’ actions and emotions are. Their feelings of joy, despair, grief, hatred, and love make them cinematic personalities as authentic in their thoughts and words as those of their creator. Anderson does not always succeed when he sets out to make a movie, but even his greatest failures – of which there are precious few – are way more enjoyable than the vast majority of films being released these days. There is a reason why the Criterion Collection has released nearly every film directed by Anderson on DVD and Blu-ray, and I am still waiting with great anticipation for that Life Aquatic with Steve Zissou Blu. French New Wave director Jean-Luc Godard, a powerful influence in cinema and pop culture from the 1960s onward thanks to his radical films, depicted in some of his films the need for the adolescent or youth to maintain their autonomy in the process of society attempting to crush it and mold it for their own purposes. This is pure literary, but in cinema the right director can demonstrate explicitly the harsh tendencies of society. In his newest film, Moonrise Kingdom, director Wes Anderson, with a script he co-wrote with Roman Coppola, is approaching that topic Godard had always wrestled with, and still is today. It is not easy to do, but with Anderson’s whimsy and vigorous style of direction, unerring in its constant infatuation with capturing perfection, we are able to witness two adolescents restlessly in love in a perfectly concocted world endure an environment that is stifling and stunting their growth. 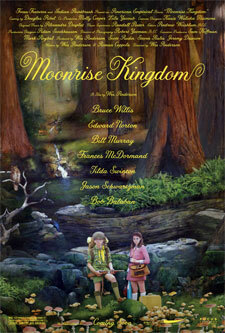 Focus Features has released a three-minute behind the scenes featurette for Wes Anderson’s upcoming romantic comedy Moonrise Kingdom. Though the film focuses on the runaway romance between two children, the featurette focuses mostly on the film’s adult cast: Bruce Willis, Tilda Swinton, Edward Norton, Bill Murray, Frances McDormand, and Jason Schwartzman. 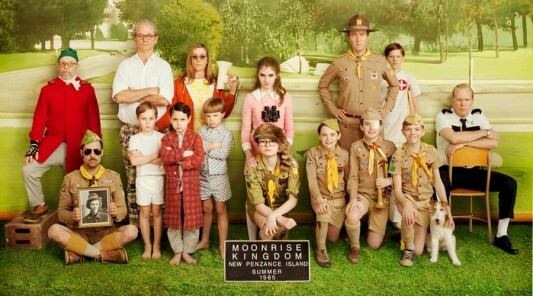 In the video they talk about their experiences working on the set of Moonrise Kingdom and about Anderson’s directing style. You get to see what it was like on the set of the film. The gorgeous simplicity of the set pieces and the beautiful locations that Anderson chose is exactly why Moonrise Kingdom is one of my top ten highly anticipated films of 2012. 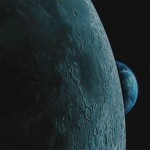 The first announcement teaser trailer for Transformers: Dark of the Moon has now arrived online. And though it’s dubbed an “announcement” teaser, it’s actually more like a traditional teaser and shows off some interesting things. 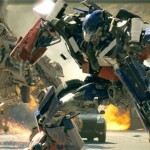 The movie comes once again from director Michael Bay, and is the third in the franchise following Transformers (2007) and Transformers: Revenge of the Fallen (2009). In the announcement teaser trailer, we’re whisked back to 1969 during the Apollo 11 mission that saw Neil Armstrong become the first human being to step foot on the moon. But right after their historic accomplishment, the astronauts on the mission discover something even more remarkable. Be sure to head on over to the other side now to check out this first trailer for Transformers: Dark of the Moon! Things are starting to get rolling on Transformers 3, and as you all know, a lot of work must be done in order to make up for what we were given in the first sequel, Transformers: Revenge of the Fallen. To helps fans start to get excited, some casting and talking has occurred this week, and both are worth peek and a read. To start things off, The Wrap is reporting that fan-favorite Alan Tudyk has joined the cast of the third movie. It’s not known who the Firefly, Dollhouse, and V star will be playing in the movie, but he’s always a welcome addition to any movie being made. The actor joins fellow newcomers John Malkovich, Frances McDormand, and Ken Jeong Join who were cast in March, as well as Grey’s Anatomy star Patrick Dempsey.